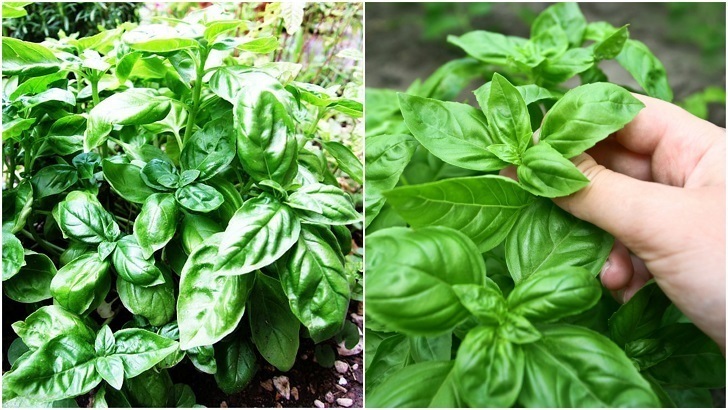 As one of the easiest herbs to grow indoors, many newbie gardeners may find themselves landed with an abundance of pungent and peppery fresh basil leaves to use up. Availing of the flavor and healing powers of basil shouldn’t be of concern though – this herb is as easy to use as it is to grow! You can harvest basil from your plant at any time, which is why a sunny kitchen window is the perfect position for this delicious herb. Not only will you be flavoring your food, you’ll also be encouraging the plant to produce even more leaves. For best results, harvest small amounts regularly (no more than one third of the entire plant at any one time). Rather than cutting off a stem in its entirety, pinch a few leaves off several stems which will encourage the plant to fill out. One of the best known sweet basil based recipes, pesto alla Genovese is fantastic on pasta, pizza and salads, or served with meat or fish. This recipe calls for fresh aromatic basil, raw garlic, aged parmesan, pine nuts and extra virgin olive oil. For a dairy-free and vegetarian version (parmesan contains animal products! ), this pesto isn’t quite such a traditional recipe, but it’s pretty close and packs a flavor-filled punch. An incredibly versatile herb, basil can be used in all manner of dressings and marinades. Lemon juice and honey perfectly complement basil’s pungency in this delicious salad dressing while a basil, balsamic and garlic marinade is perfect on chicken or tofu. Preserving the flavors of basil through vinegar or oil infusions is a simple way to store and use your excess basil leaves, without the need for fancy equipment. Try making this basil vinegar for use in salad dressings, marinades and other recipes requiring vinegar. Likewise, basil oil can be used for all these recipes and more – including as a healthy drizzle over cooked vegetables or as a dipping sauce for warm, crusty breads. Flavored butters are a wonderful tasty addition to grilled meats and vegetables, pasta, potatoes and breads. Save money and preserve your basil bounty by making your own flavored organic butter. Yet another way to use your basil leaves while sneakily imparting a flavor burst to your food, basil salt is surprisingly easy to make. One of the most classic pairings in Italian cuisine is tomato and basil – which is why you can’t go wrong adding some fresh or dried basil herb to your tomato based pasta and pizza sauces, along with those for cottage pie, lasagna and more. Soups, too, are a fantastic way to enjoy basil. Aside from the classic tomato and basil soup, the herb pairs well with carrot, zucchini, mixed vegetable, pea, broccoli or chicken. While we all think to add basil to a Caprese salad, few experiment with this zingy herb in other leafy meals. But it’s delicious chopped up with other greens, and always works with tomato and cucumber. To really push the boat out, try this basil Caesar salad; pair basil with feta cheese or get in the summer mood with a blend of strawberry, cucumber and basil! Basil works in all manner of sandwiches too – whether they’re open or closed or served on wraps, pita breads, flat breads and more. Basil’s peppery flavor doesn’t just lend itself to savory dishes, it actually works surprisingly well in a great many desserts too! Lemon basil yogurt cake, mint basil syrup, strawberry basil shortcakes, basil ice-cream, strawberry galette or basil lime sorbet are just some of the ways you can satisfy your sweet tooth while making use of your basil plant. Add a little zing to many cocktails with a few torn basil leaves – gin and tonic, vodka and soda, or even a mojito will all benefit from its peppery flavor. Basil should be part of everyone’s natural medicine cabinet – some varieties of the plant are actually as strong as anti-inflammatory drugs and have been shown to reduce swelling in arthritic patients by up to 73% in just 24 hours! Make your own basil essential oil from your organic and homegrown plant and reap its many health benefits – including relief from nausea, motion sickness, indigestion, constipation, respiratory problems, stress, uneven skin tone, insect bites and poor circulation. Because basil works as a muscle relaxant and has analgesic properties, steam infused with the leaves of the plant is said to be an effective treatment for tension headaches. Add a tablespoon of dried basil leaf, a handful of fresh leaves or a few drops of basil oil to three cups of water and bring to a boil. Transfer immediately to a large, heat proof bowl. Drape a towel over your head and lean over the bowl, positioning the towel to keep in as much steam as possible. Breathe in the vapors for up to ten minutes. Alternatively, you can diffuse some basil essential oil through the room, or massage a drop or two (mixed with a carrier oil) onto the temples. Known to relieve anxiety, basil leaves or oil can be added to your bath – along with a cup or two of Epsom or Himalayan Pink Salt. Its antiseptic properties will also keep your skin soft, supple and free from acne or other skin infections. The age old remedy of steaming the face to relieve congestion has been used to enhance health for thousands of years – by Hippocrates, the father of medicine; by the ancient Romans; and by the native people of North America. Add a little fresh or dried basil to your steam and you’ll be increasing its decongestant powers. The plant’s natural antihistamine and analgesic properties will have you feeling better within minutes. With so many toxic chemicals in antiperspirants and deodorants, it’s wise to steer clear of them for both optimal health and the good of the environment. That doesn’t mean you have to go around smelling like old gym socks though – there are plenty of natural ways to deal with body odor…and one of them is by eating more basil! In the US, one in three adults have high blood pressure, with the majority of cases believed to stem from poor diet. Luckily for basil cultivators everywhere, extract of basil has been shown to lower blood pressure (albeit for brief periods).